I will start my blog by showing you a finish I had 2 weeks ago, my fifth pattern "Broken Frames". 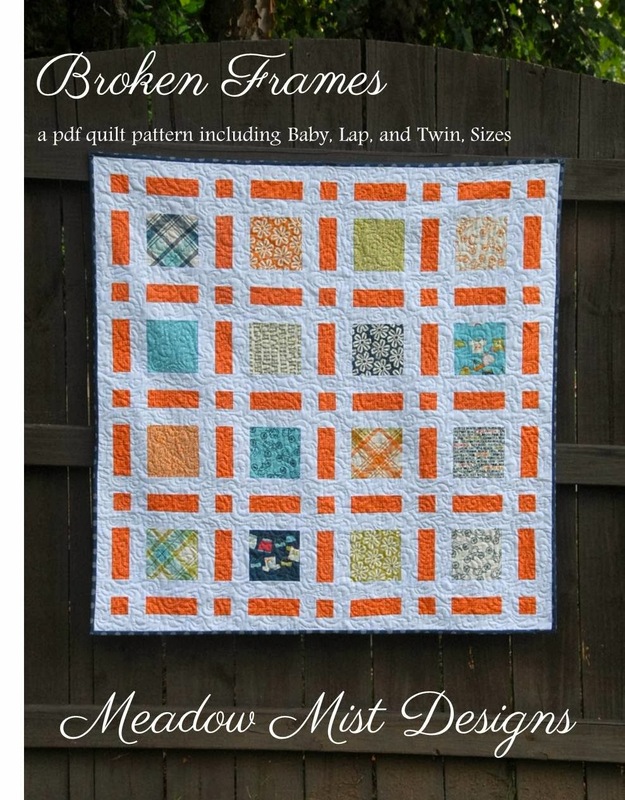 I created this pattern to use of some of my way too slighty large collection of charm squares. I wanted to highlight the squares without cutting them up too small and some some interesting detail to "frame" the squares. I used some charm squares from Lucy's Crab Shack by Sweetwater by Moda and paired it with some orange on orange plus sign fabric from Riley Blake. Thus, Broken Frames was born. I used a new to me quilting pattern. I was practicing a quilting pattern by Angela Walters with the pattern being a open paisel pattern. Once it was done it kind of looked like some mini swirls which I liked. Because I am a nerd (chemical engineer by training who writes patent applications by day) I love quilty math. I wrote the pattern for baby, lap, and twin sizes. The pattern is now available in my craftsy and etsy stores. Hello there, I have been resisting for some time about starting a blog. I really do not have time for one, but I really wanted a place to keep all of my quilty finishes with a little more description than flickr can give me and I want to be able to link in with all of the fun quilt links.